Modularized cable management system, 6+2pin PCI-E connectors for multi-GPU graphic cards, Four independent +12V outputs, +5V and +3.3V DC to DC design, Intelligent fan speed control for optimal acoustic, 135mm double ball-bearing ultra long-life fan, 4pin Molex easy-swap connectors, Independent +12V feedback circuit design for improved reliability, 105 degrees C high-quality Japanese bulk capacitor ensures reliability and superior performance, Multiple output protector: OCP, OVP, OPP, UVP and SCP, 3 oz. copper PCB: lower impedance increases efficiency and electrical current flow, Full range active power factor corrector (PF>0.99), Supports the latest ATX12V V2.31 & EPS12V V2.92, MTBF>120,000 hours, ErP Lot 6 Compliant. Pay only P 1,333 a Month for 6 months. Or pay only P 713 a Month for 12 months. Native to the North African region, the Fennec Fox is a small desert dwelling nocturnal creature that has adapted very well in high-temperature environments. It has distinctly large ears which not only serves to make the Fennec Fox look absolutely adorable, but also helps it dissipate heat much more efficiently and hear movement of possible prey underground. It is the smallest species of canid in the world yet it is a highly capable predator even on such a harsh environment, proving once again that size is not always a decisive factor of capability. These are also some of the properties I look for when it comes to power supplies. Unfortunately, bulk and a heavy weight can often be expected from high-capacity, high-efficiency PSU offerings. These are also often paired with high-RPM fans to sufficiently cool the internal components, which in turn produce a lot noise. Aware of these issues, and taking some cues from the desert fox, InWin set out to design their 3rd generation Commander series in-house and created a power supply unit that is small yet highly capable. The In Win Commander III Desert Fox power supply is a hybrid modular unit that has quad +12V rails with 25A max output and carries an 80 Plus Gold efficiency rating at 50C. 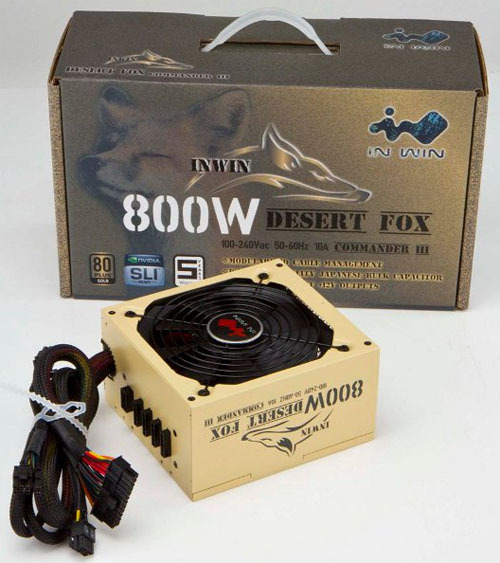 The In Win Commander III Desert Fox 800W power supply uses +5V and +3.3V DC-to-DC design and supports the C6/C7 states of the new Intel Haswell processors. All the cables on the 800W In Win Commander III Desert Fox are sleeved and four 6+2 pin PCI-connectors are available supporting NVIDIA SLI or AMD CrossFireX. The 800W Commander III PSU uses 105C Japanese capacitors on the primary filter and the unit also features over-current, over-voltage, over-power, under-voltage and short-circuit protection. The In Win Commander III 800W power supply also has MTBF rating of >120,000 Hours.